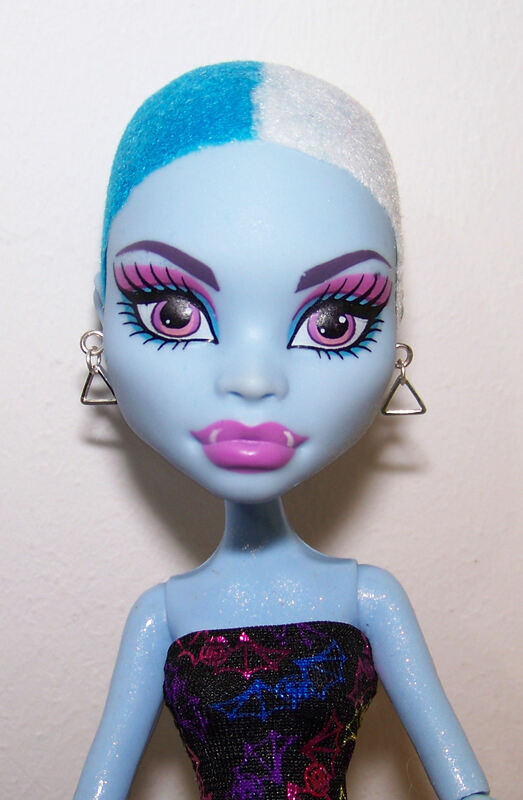 I don’t have proper photos of the finished doll yet as she needs lips and better lighting but, here, have some work in progress pictures of Gradient Blue Mbili (aka don’t make me use the word ombré when you mean camaieu) using leftovers from the Catrine reroot. I used black as a seventh colour at the back as I didn’t have enough ink blue to do more than a stripe. 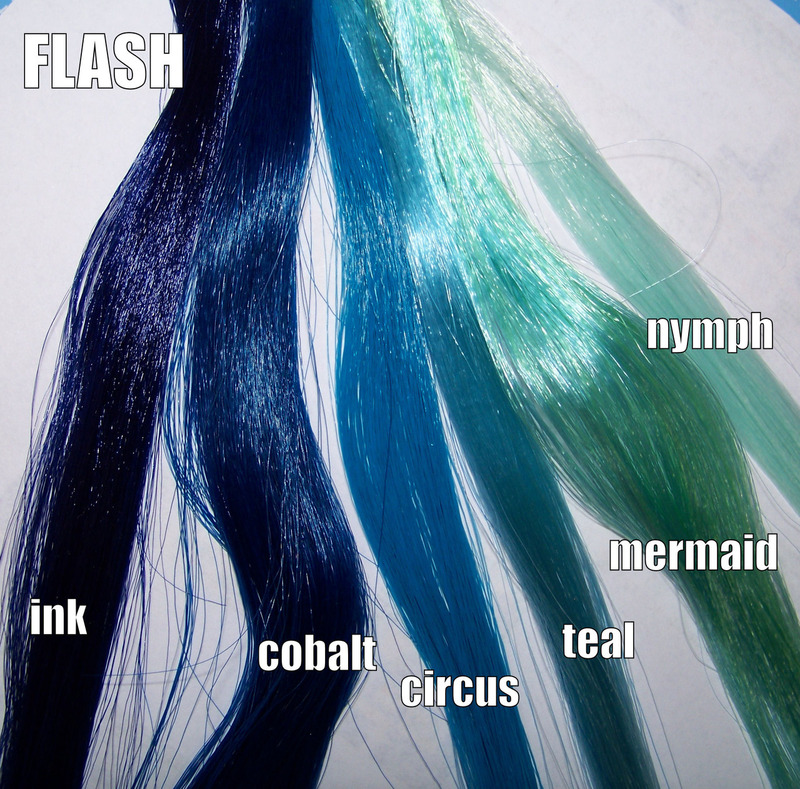 I also realized about 60% through that I did not have as much cobalt leftover as i had thought (actually enough for like 3 plugs) which was the impetus to sew all of the wigs to raise money for hair to finish this which is circular craft logic insanity and happens more often than i’ll admit. 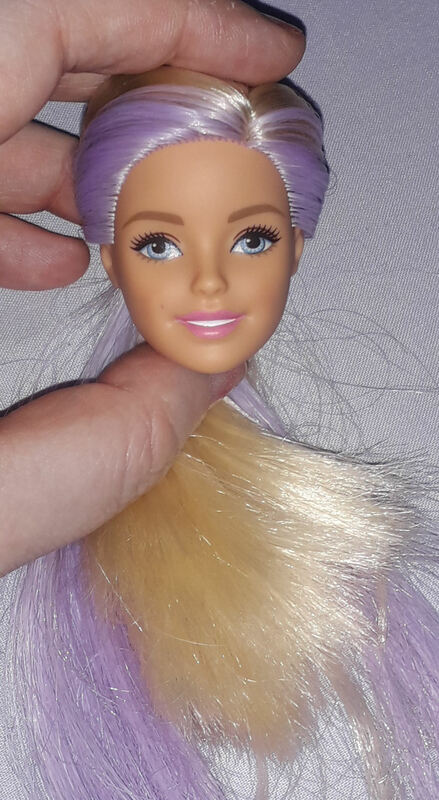 Also I have so much doll hair but I keep ending up without the specific colour for the specific design that’s already half finished. I’m brilliant at seeing a situation and knowing within seconds how many ways it could go wrong, I can look at a product design and see within seconds the flaws and limitations and ways to misuse the product, I can tell from people’s use of language the things they are hiding or trying to say without actually saying but i can’t plan ahead for a craft project or food plans without extremely detailed checklists. I mean I’ve done over 150 full reroots and have been rerooting since 2002 but have a checklist I now follow religiously because of too many “oops” half way through. 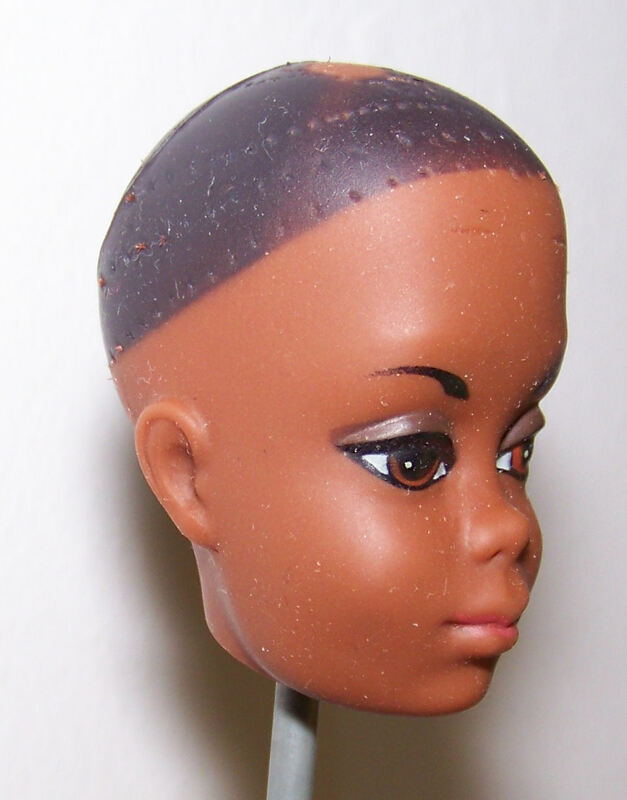 boil head. do not touch with anything until cool as it will scrape the paint decals. guess “check that you have enough of all the colours” was missing LMAO. 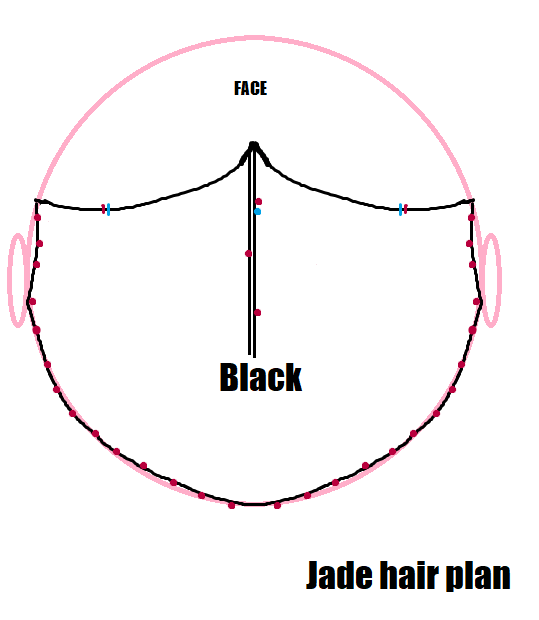 It’s a sidepart gradient reroot using the same semi circle system as for Licca or MH (see my previous posts for the diagrams) which means that 6 colours are visible on one side of the face, 5 on the other. 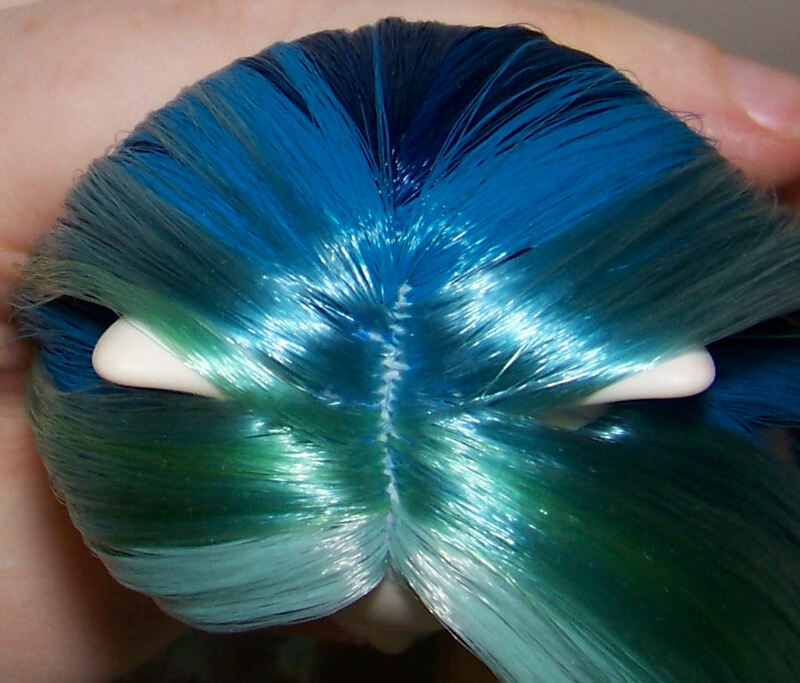 The middle colour (the pale turquoise) is split 4mm for one side of the parting and 2mm for the other. 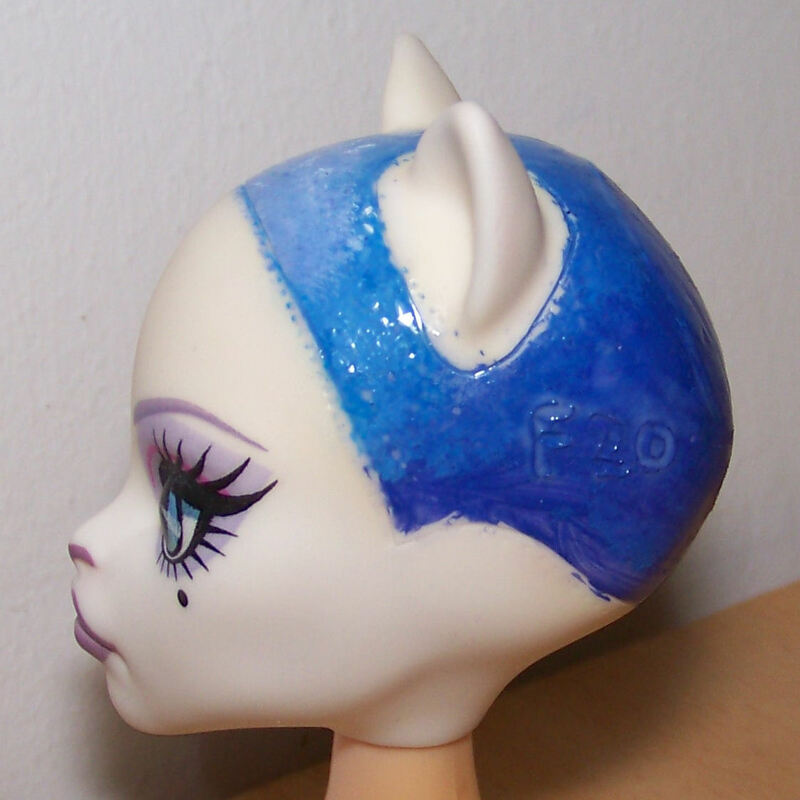 I made the portions too wide at the parting which means only 4 of 6 are properly visible before the drop off – This is because monster high heads or liccas are mostly spherical and barbies are ovoid. 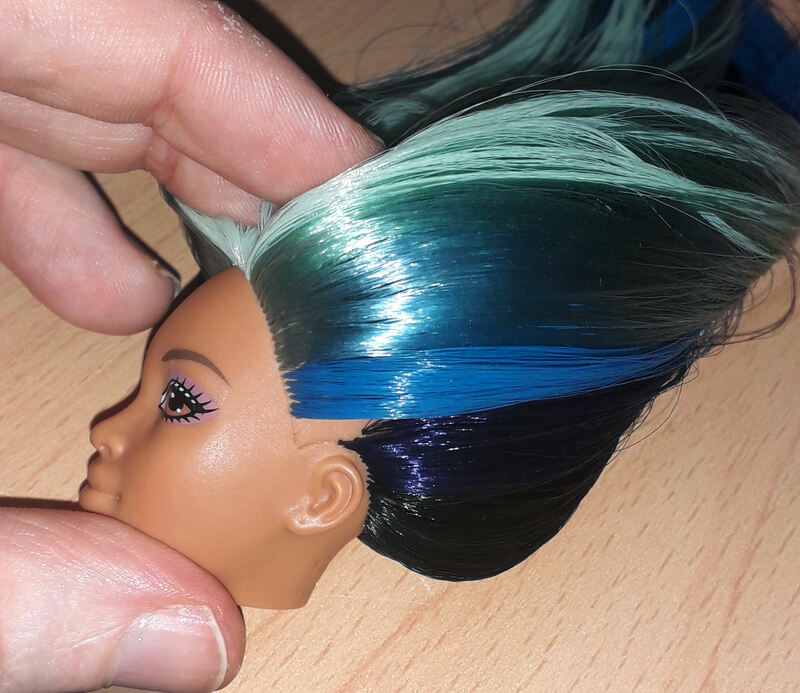 So please note if you’re doing a 5-6 colour gradient reroot for Barbies: 5 or 6mm at the front but the parting portions need to be 3-4mm apart. 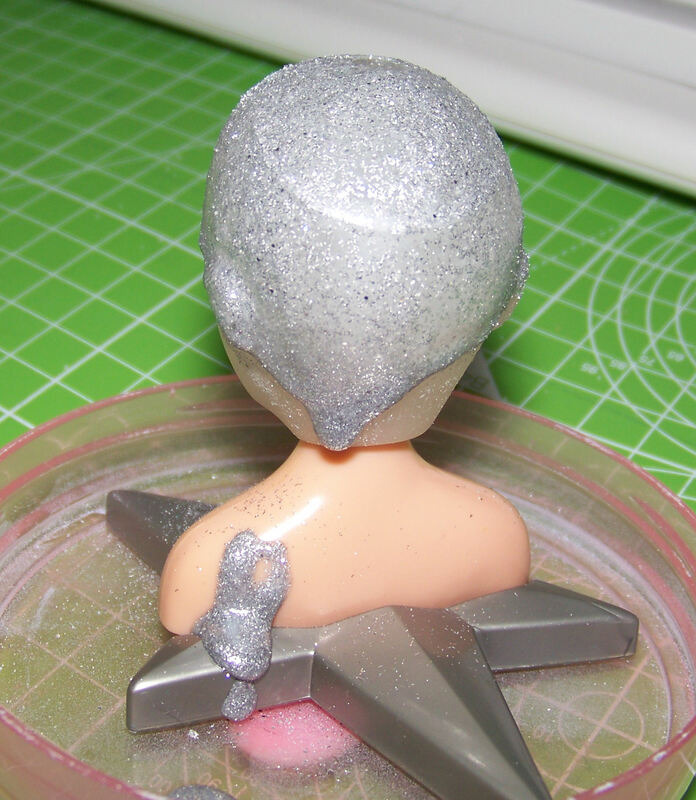 Editing to add that I use E6000 for fixing vinyl holes and UHU all purpose (not the green version) to seal the hair in. 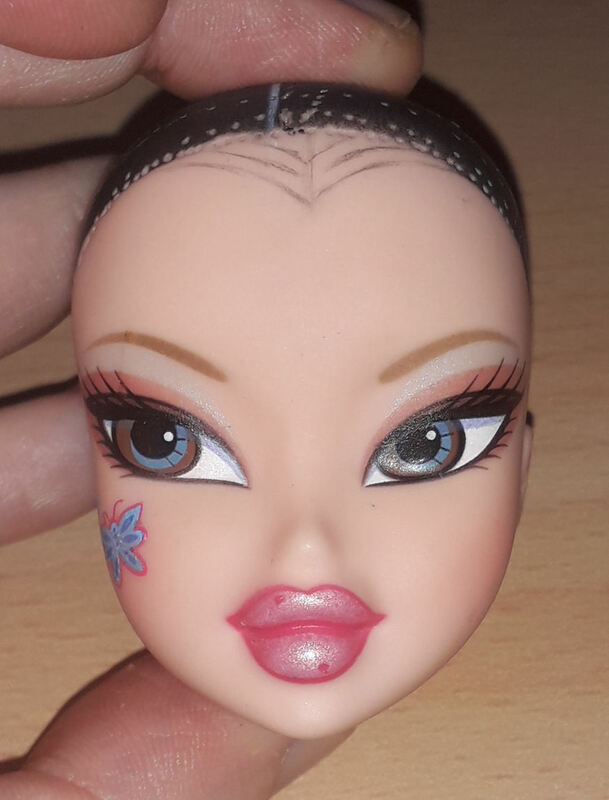 This entry was posted in Tutorials and tagged barbie, reroot, rerooting on December 5, 2018 by saffy. 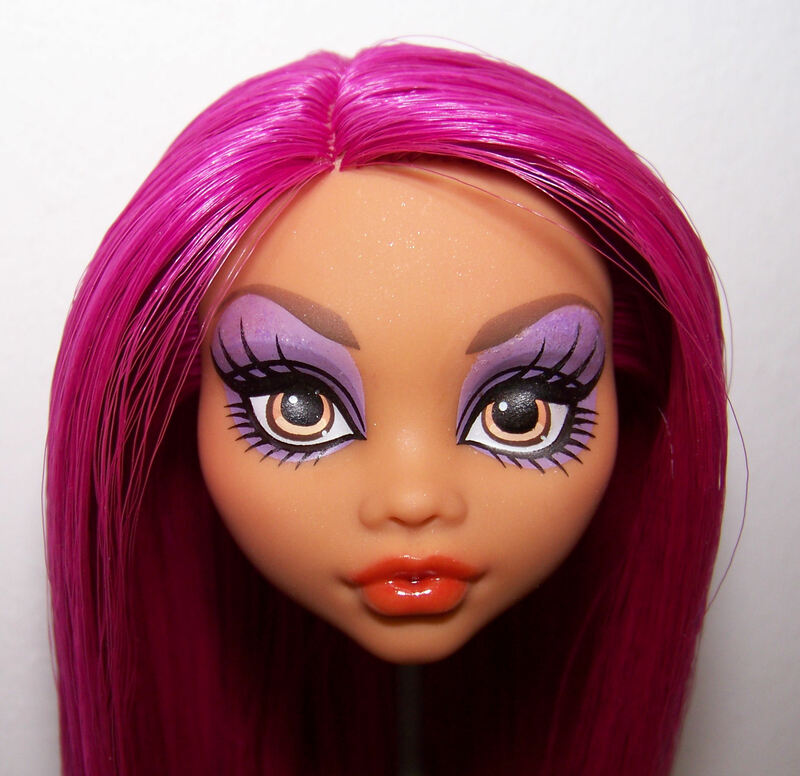 Tutorial for quickly making a generic doll into a custom to gift, donate or resell. Especially useful around the holidays. 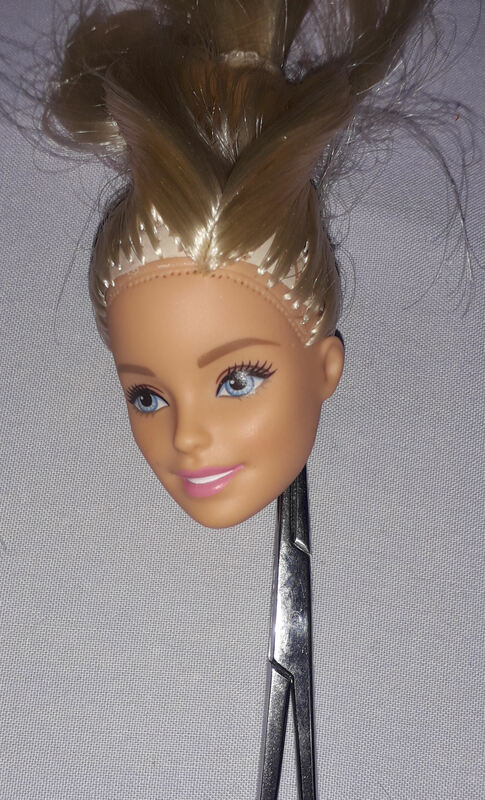 a chopstick, a clean screwdriver, tweezers or hemostats to scrape the inside of the head. 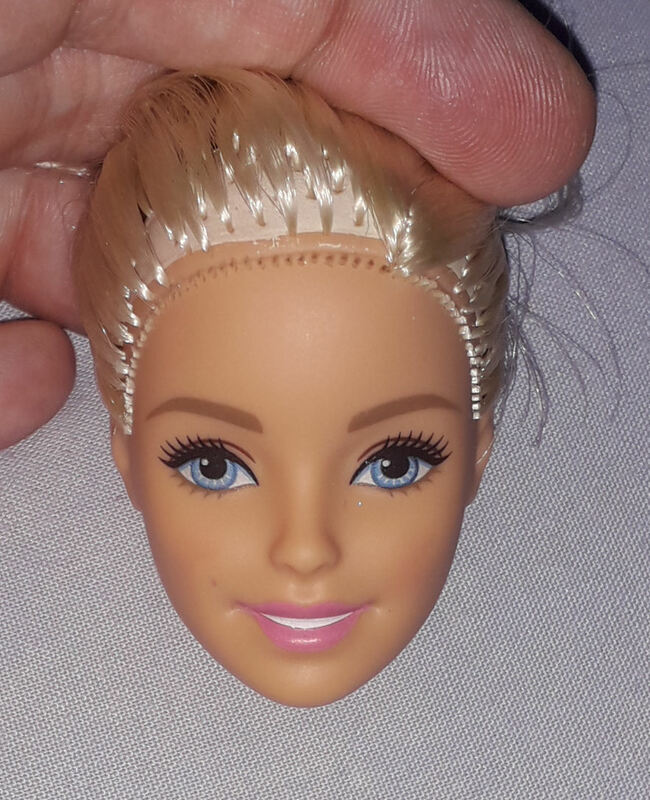 First put the doll’s hair into a loose ponytail then gently cut the first line of hair (you can brush it out later), put your chopstick or hemostats inside the neck and scrape to pull the hair out of the holes then root in the hair. Listen to a podcast or watch some tv to not get too bored as this is a bit tedious. 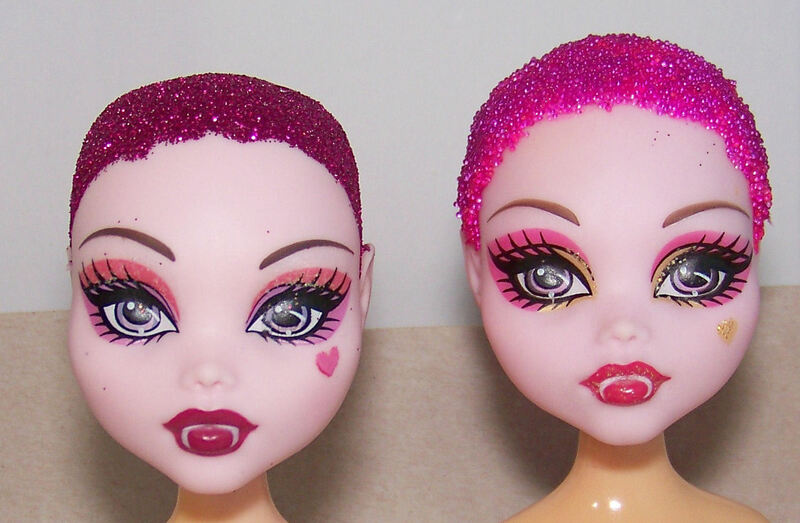 I like to put an extra line of plugs behind the originals to make the hair look thick. 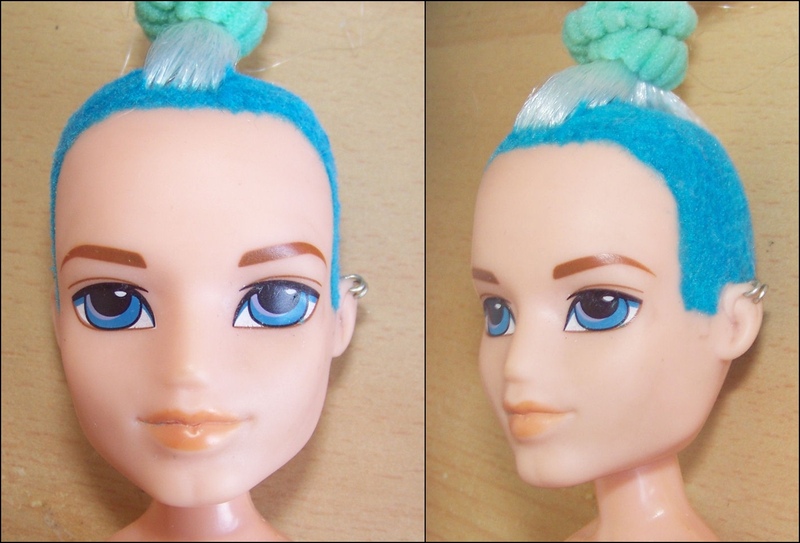 Also add a few plugs to the front of the parting so the doll will look cool with her hair down as well as in a ponytail. 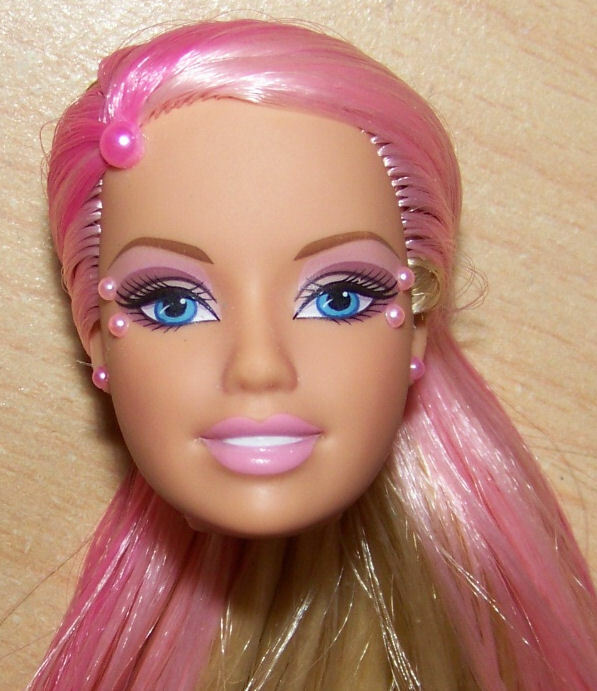 Optional: You can also change the doll’s eye color with acrylic paint or with sharpie (sharpie only on the actual eye decal or it’ll bleed into the vinyl) or add nail art decorations. 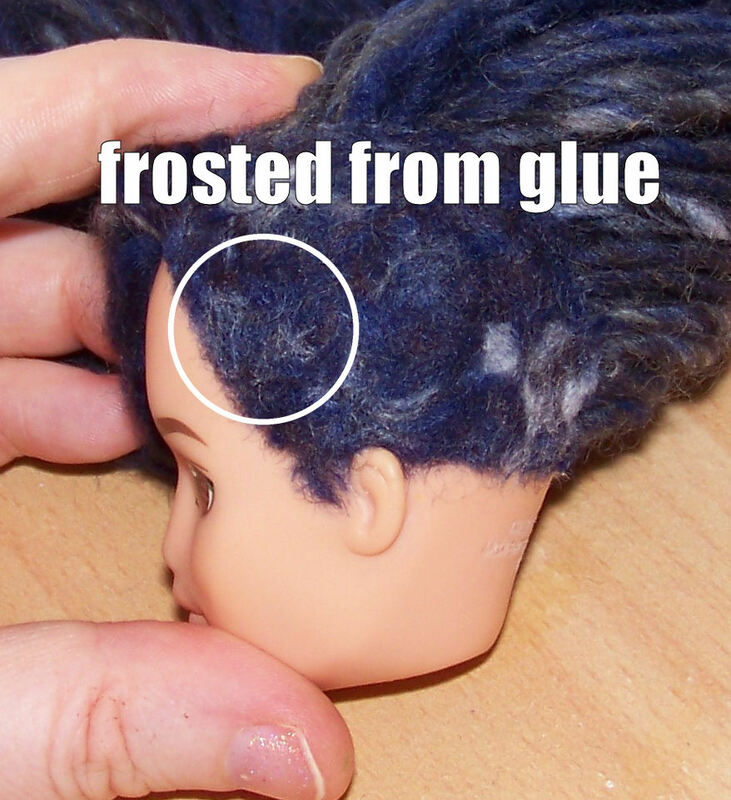 This is also the method I use for restoring dolls who have worn hair from overbrushing if they’ve still got enough hair to avoid a full reroot (or don’t have glue heads!) 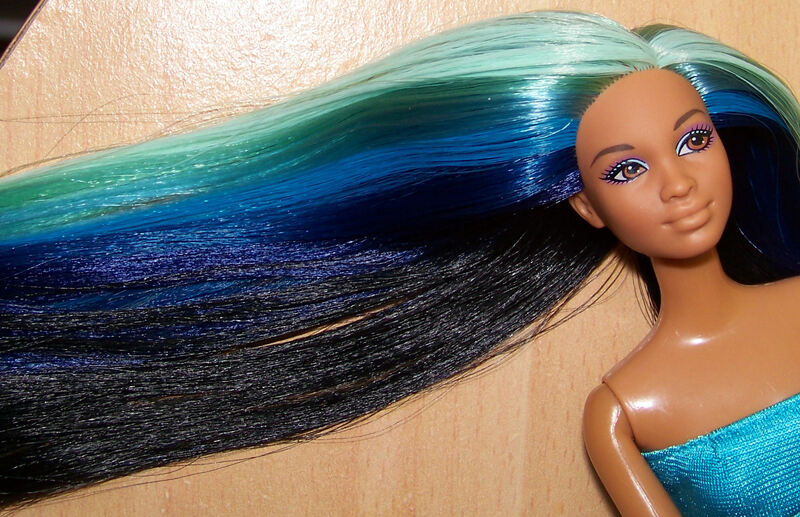 except that you’ll need to take up to 2-3 hours gently back brushing the hair with your hands and cutting out torn, shorter strands. 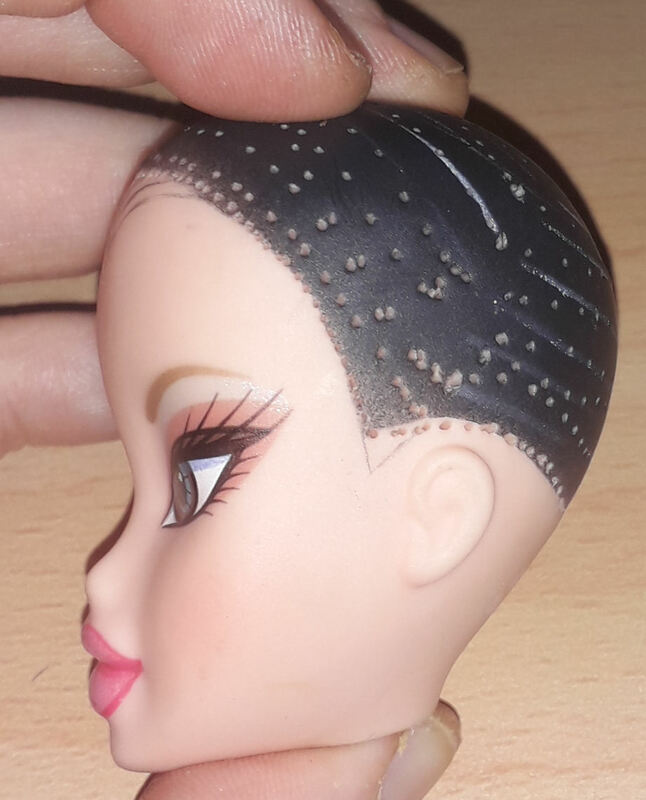 The area that gets the most damaged is that first line of plugs and the parting so cutting them out and replacing them after pruning the rest of the hair is a way of getting a like new custom doll. 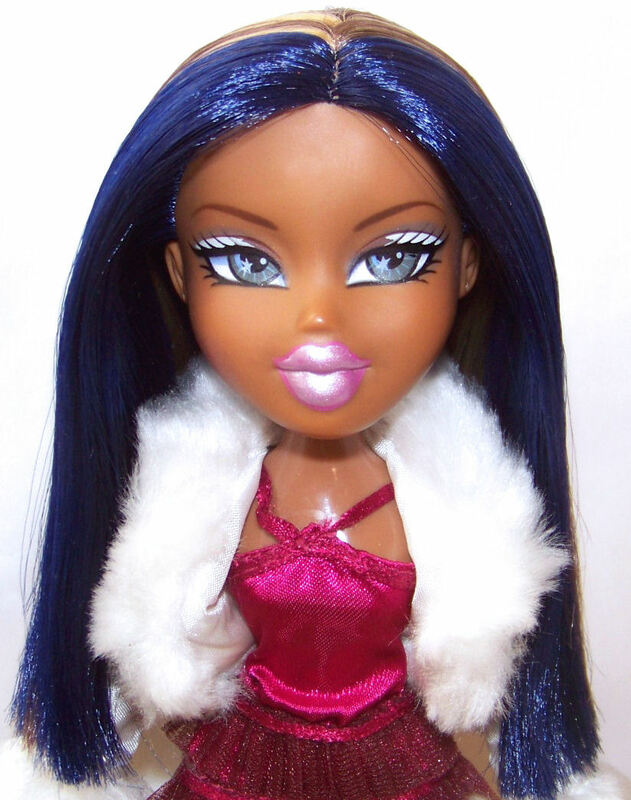 This entry was posted in Tutorials and tagged barbie, bratz, monster high, reroot, rerooting, restoration on December 5, 2018 by saffy. 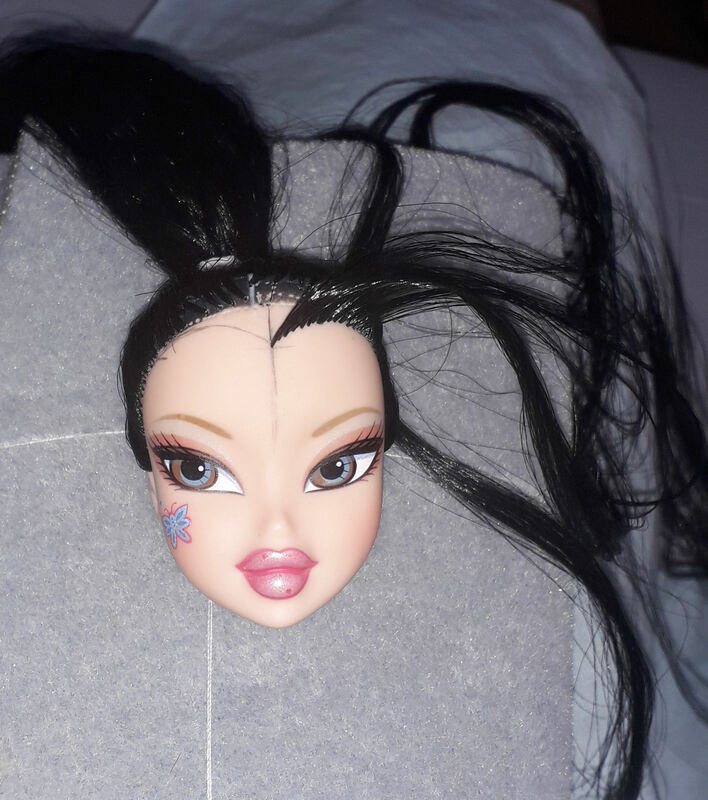 Some work in progress photos to illustrate how I’ve recently done reroots on dolls with holes in their heads (2 barbies with scalp holes for hair/crown gimmicks) and now a monster high clawdeen with the animal ears removed. 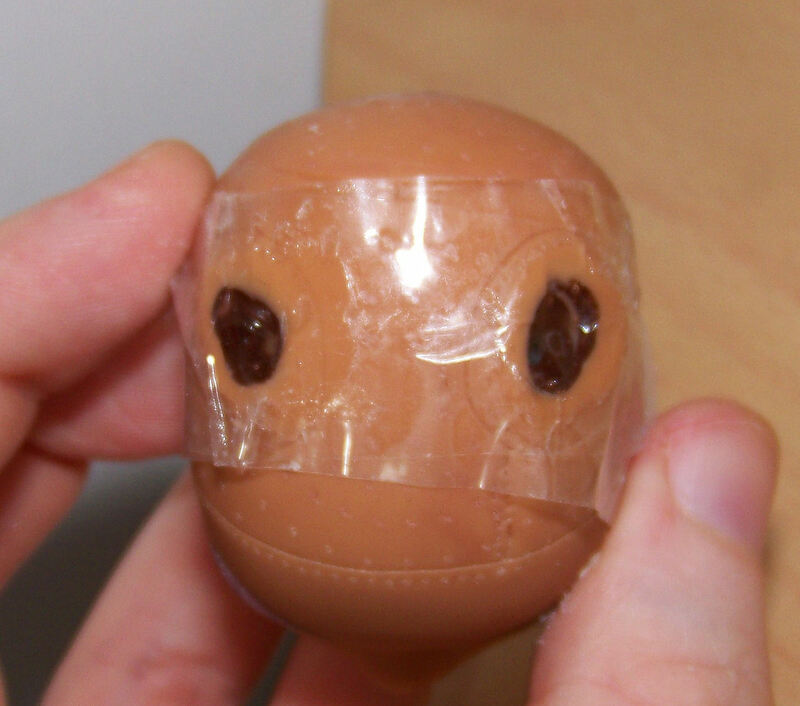 E6000 glue placed inside the head via the neck and from the outside of the holes. It’s self levelling so I tape over it and leave it to dry upside down for over 24-36h (anything less and it’ll stick to the tape when you remove it and you’ll have to add more glue. 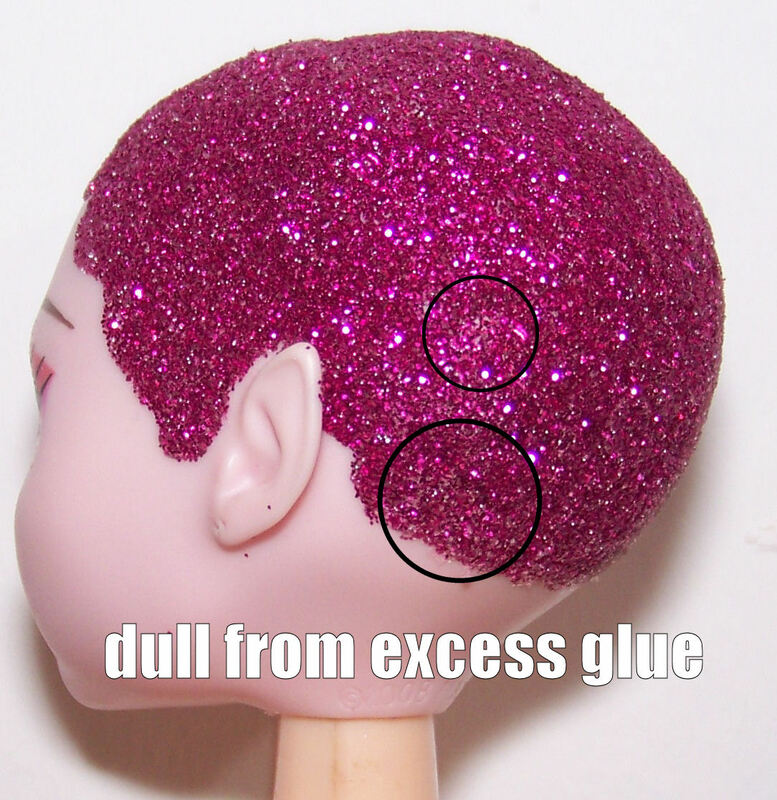 These aren’t thin strips of glue but probably 5 – 7mm globs. It’ll need another 24h to be safe to reroot. 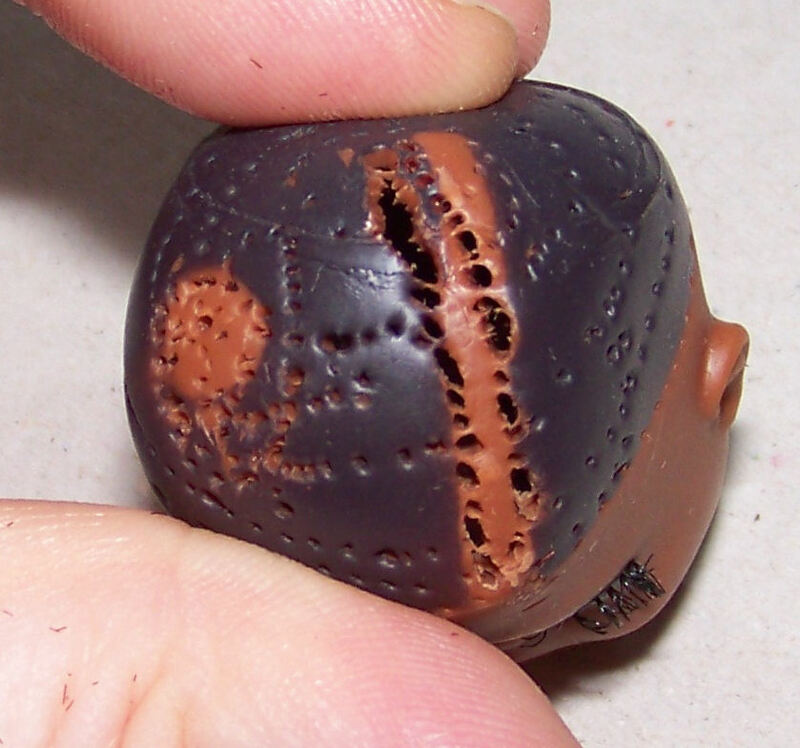 I used a very sharp exacto knife to remove any excess bits on the edge of the holes as it could easily start to peel and pull off. 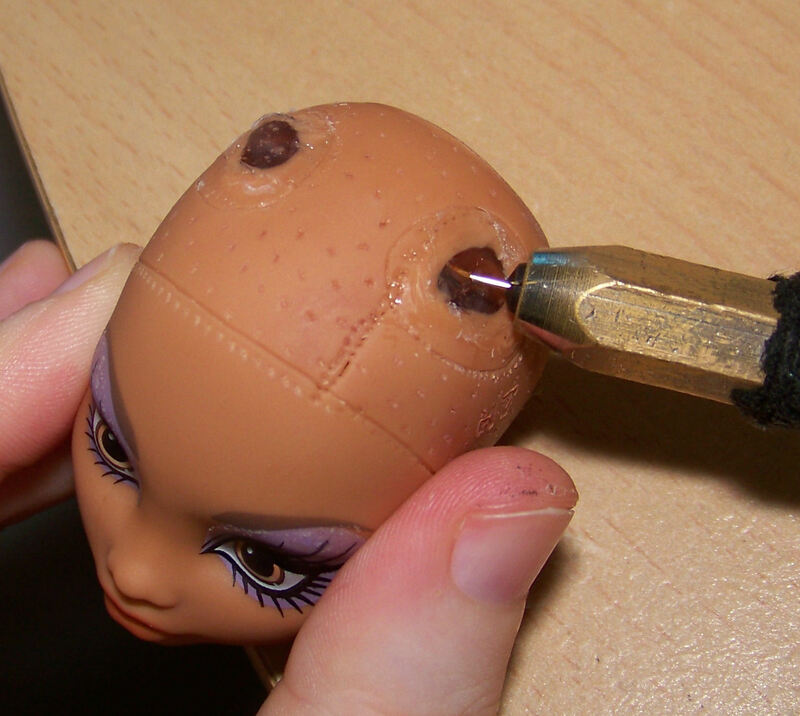 The glue grabs the needle just like vinyl does so it’s good for a tool method reroot. 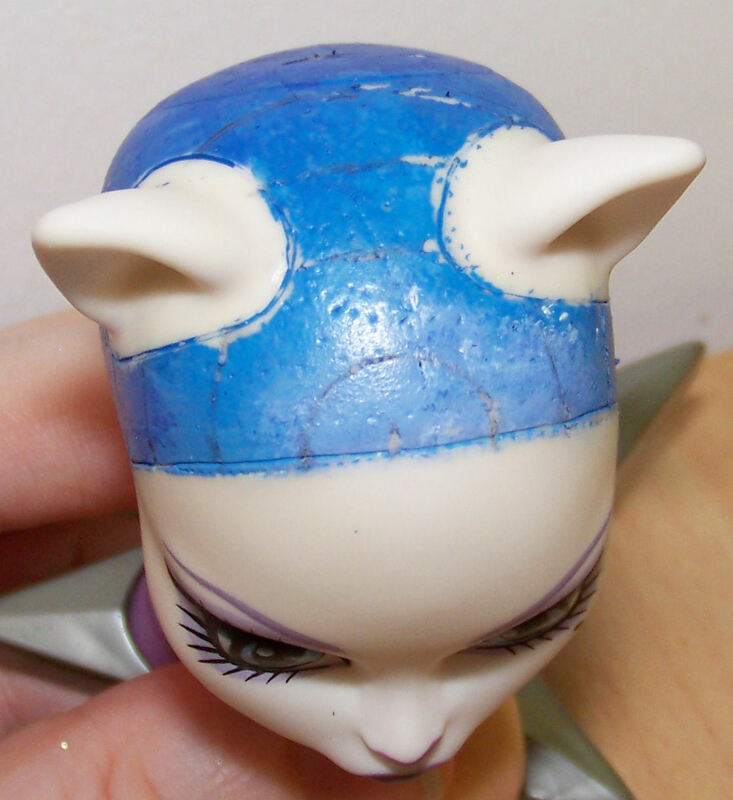 I don’t like to layer on the scalp paint too thick (if I use paint at all) to better see the existing holes. 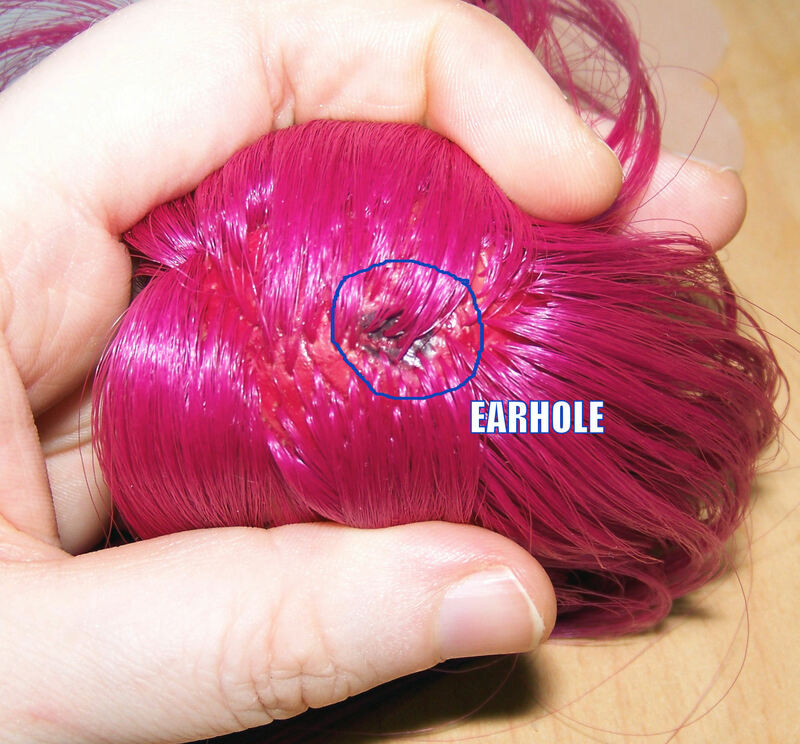 The glue patched earholes show up as slightly darker but they’re completely hidden in most hair styles. 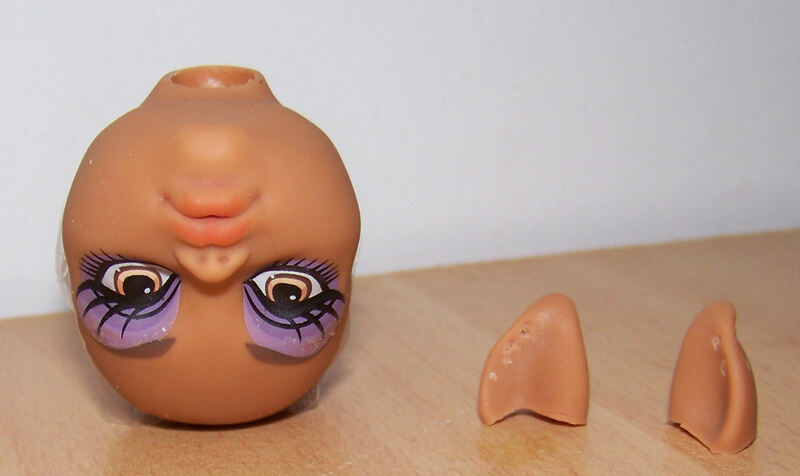 I recommend painting over the earholes to be totally opaque when rerooting a pale skinned doll such as Catrine, or if you’re using nylon which is slightly translucent. 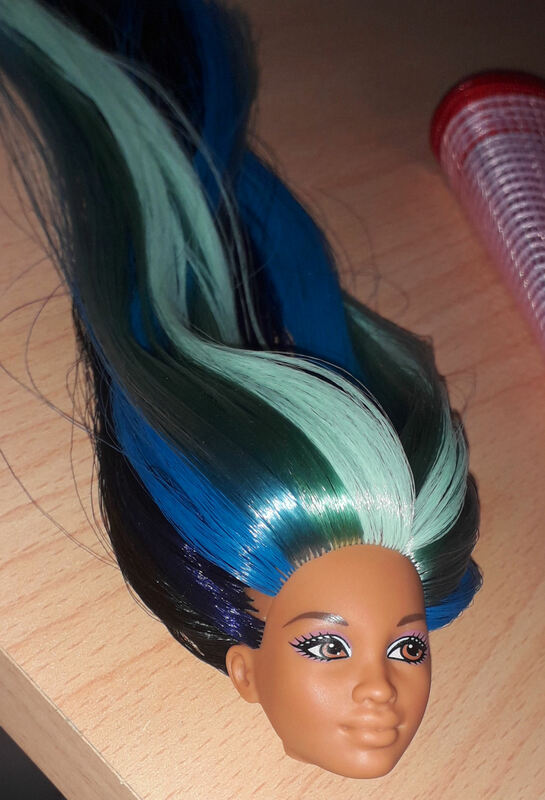 This entry was posted in Tutorials and tagged doll, monster high, reroot, rerooting on July 3, 2018 by saffy. 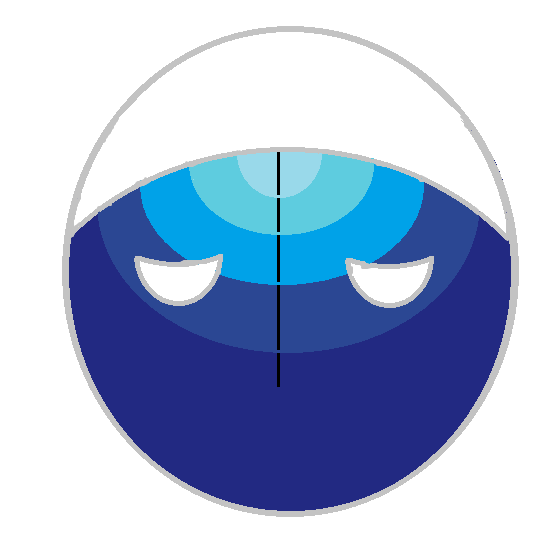 As always the weights per hank were 11g-12g with a very generous 14g and 16g for Envy and Vapour blends. 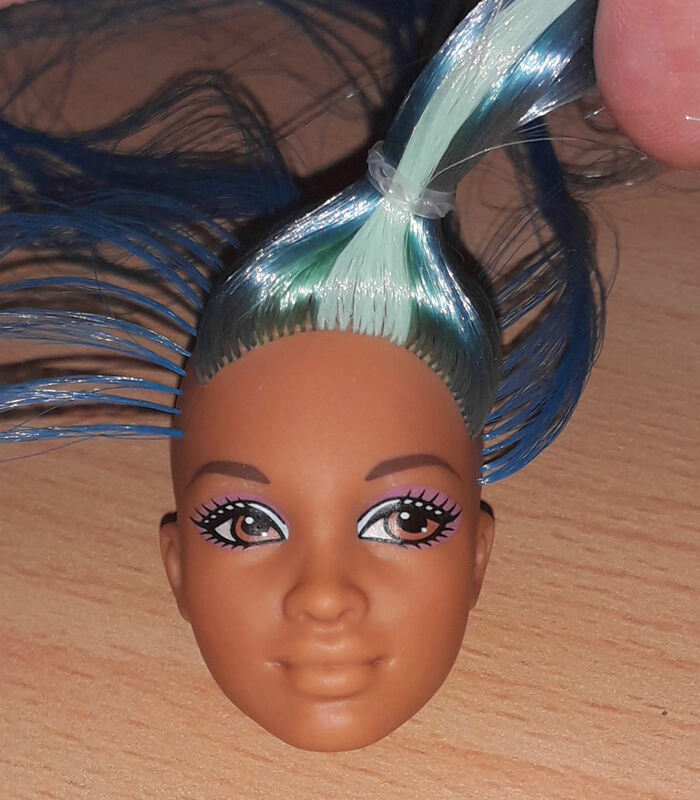 The hair arrived fast considering it was shipped from the UK. 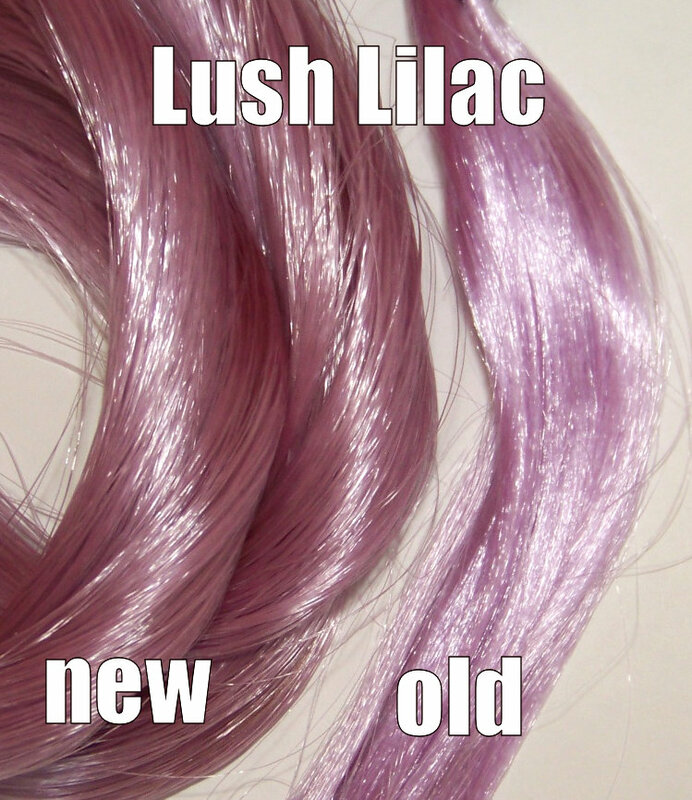 It’s very slightly more orange but turns out gorgeously cutesy pastel pink when rerooted. 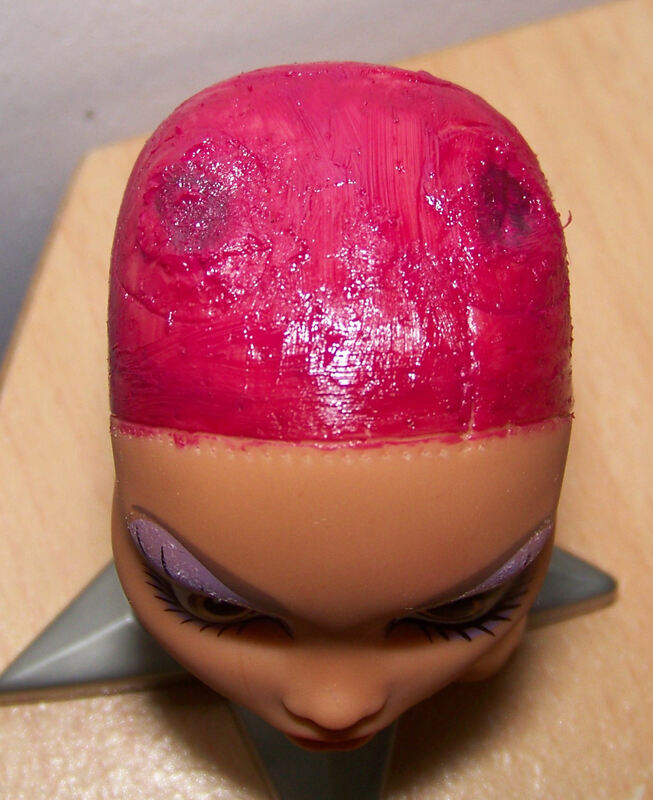 This entry was posted in Tutorials and tagged comparison, hair, reroot, rerooting, retrodolls, saran on August 2, 2015 by saffy. 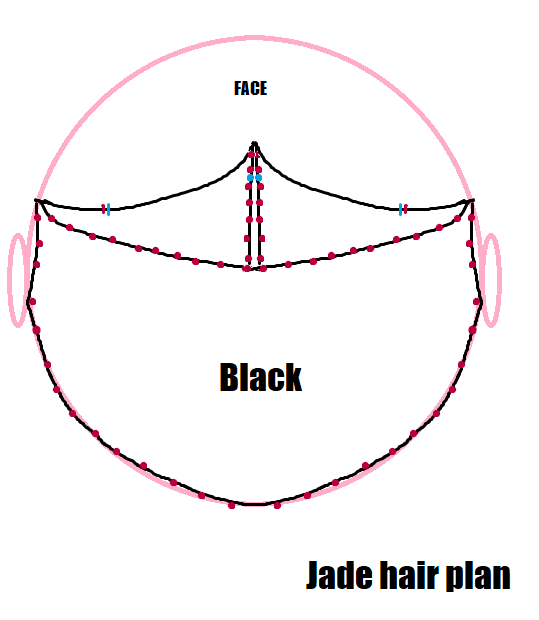 Here’s my own cheat sheet (for the tool method aka hair folded in half and for saran, though I use the same amount of nylon as it tends to be lossy during prep/work). 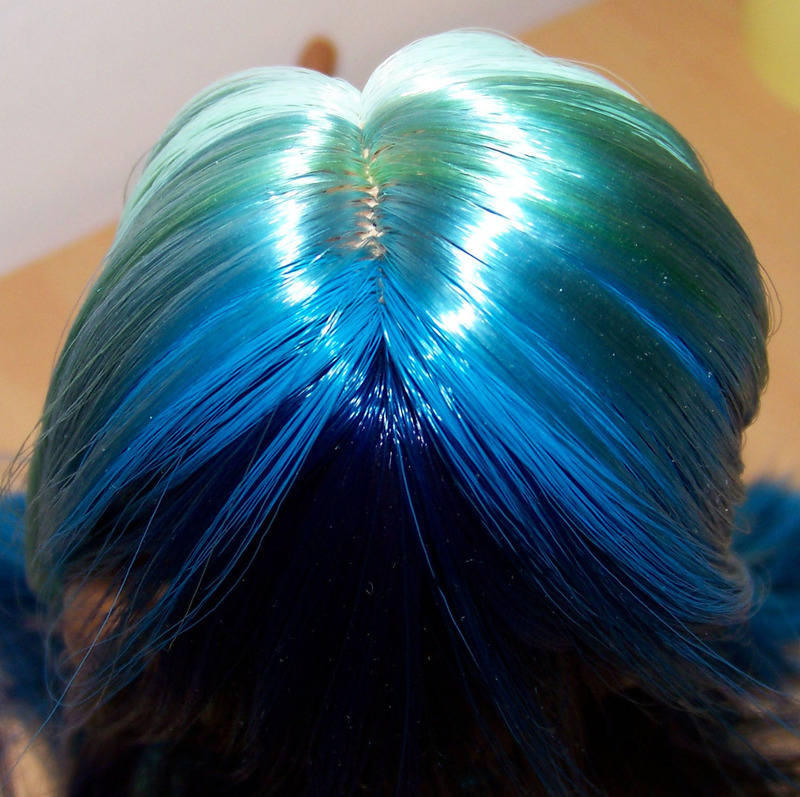 It takes 3 + 1 half (about 40g) , cut in half , to cover a 5/6″ head with very long hair. 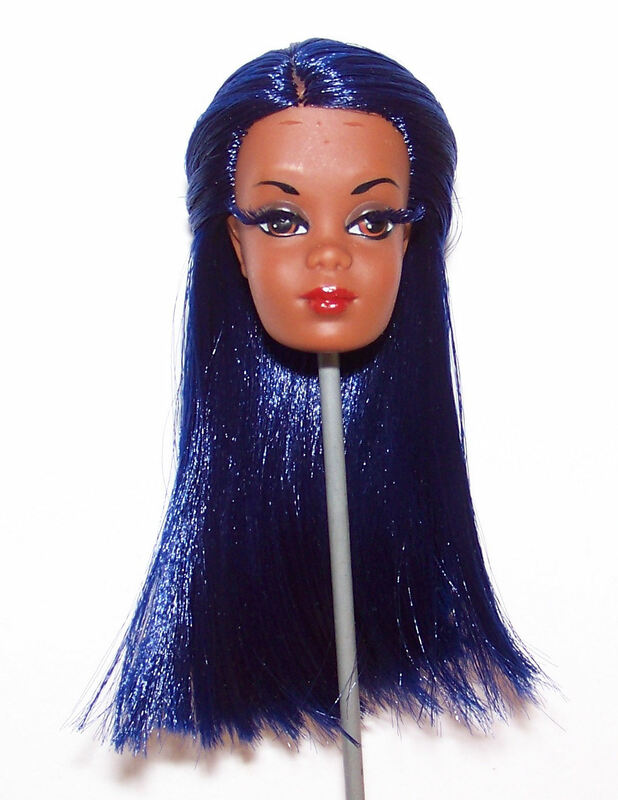 A hank can be cut in 3 = length on the doll 14cm max from roots to ends. 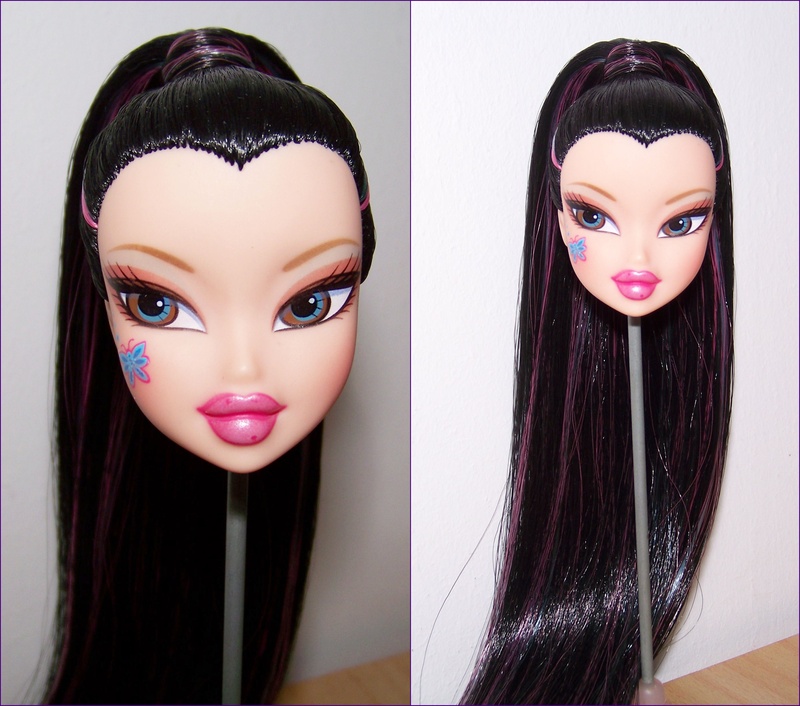 2 hanks per reroot. 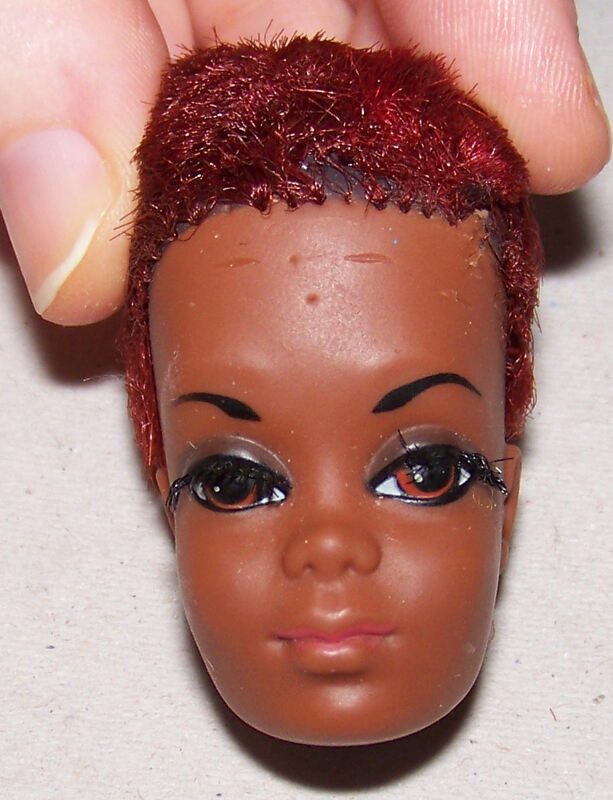 A hank can be cut in 2 = length on the doll 20 – 22cm. 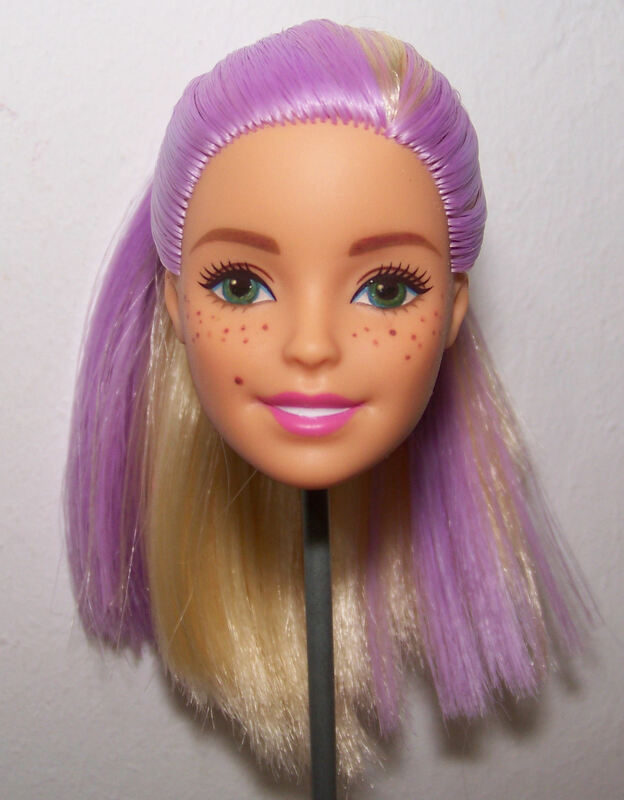 4 hanks per reroot. 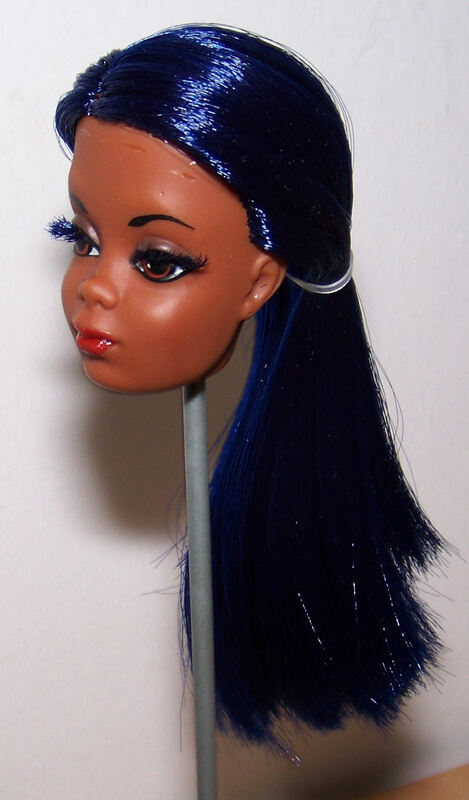 1 “Skein” of Mylittlecustoms/Restoredoll saran is 46cm and 12g, it contains as much hair as a hank but it is shorter. 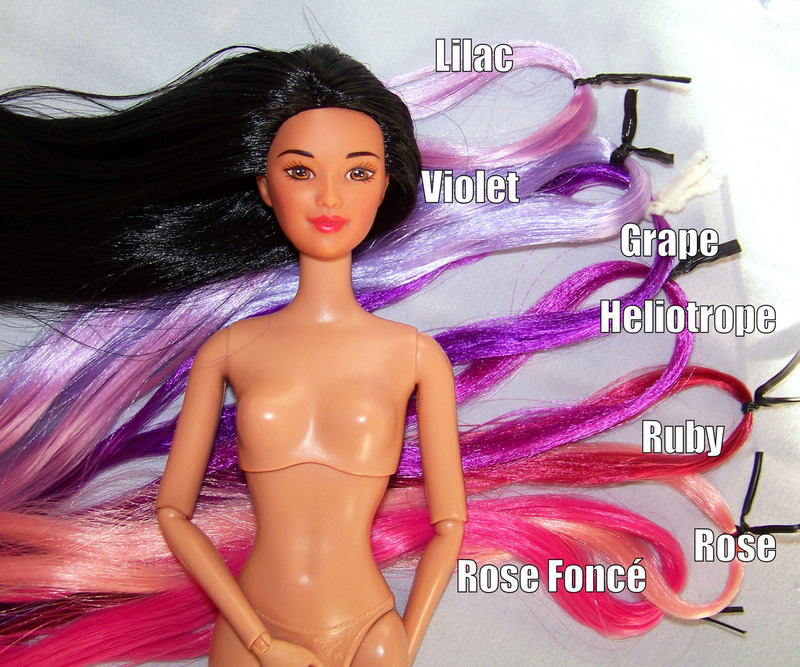 4 skeins for a reroot = length on the doll 23 cm. 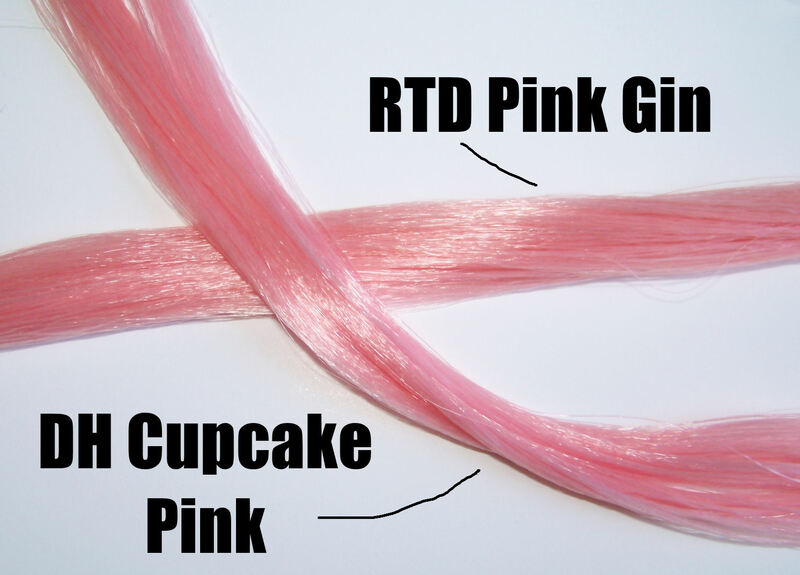 1 “XL Skein” of Mylittlecustoms/Restoredoll saran is 76cm and 40g, it contains approx. 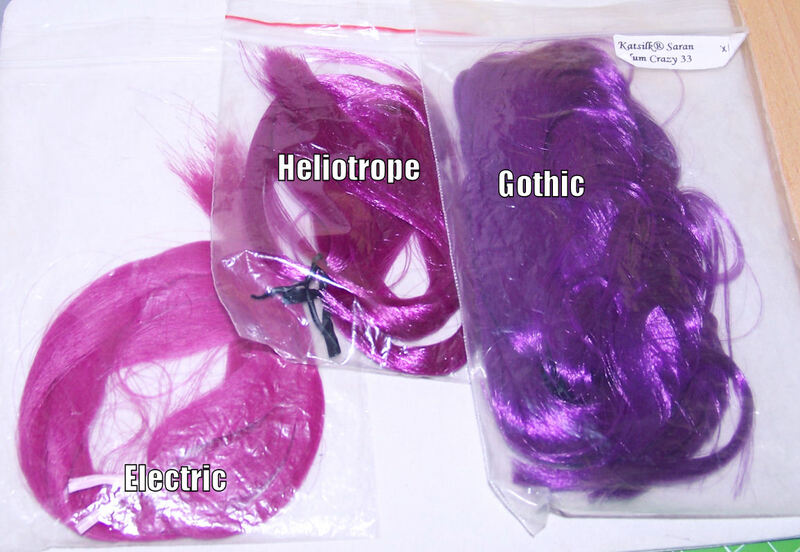 3 and 1/3 hanks/skeins of fiber. 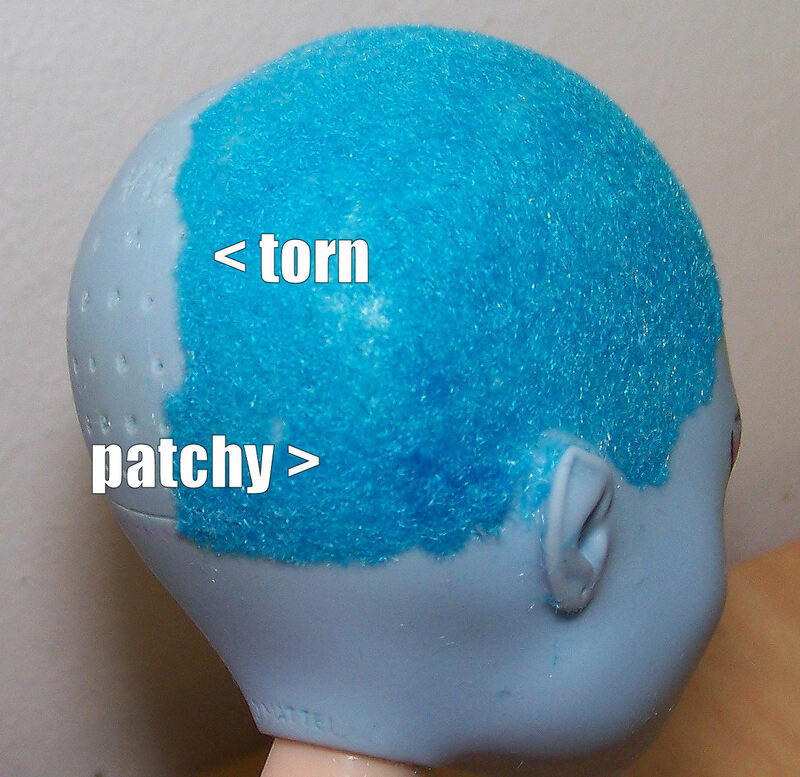 1 whole reroot (Cut in 2) = length on the doll 19cm. 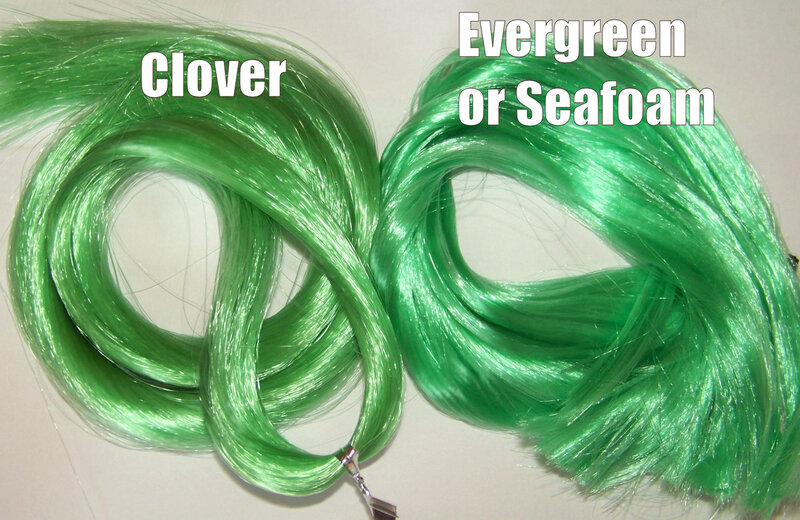 Not using dollyhair hanks any more as they were averaging 8-9g. See https://docs.google.com/spreadsheet/ccc?key=0As0WIngBCIdZdFIzRUdFZmZONktVNzM2eUd5STczVWc#gid=2 for the colour matches between sellers. 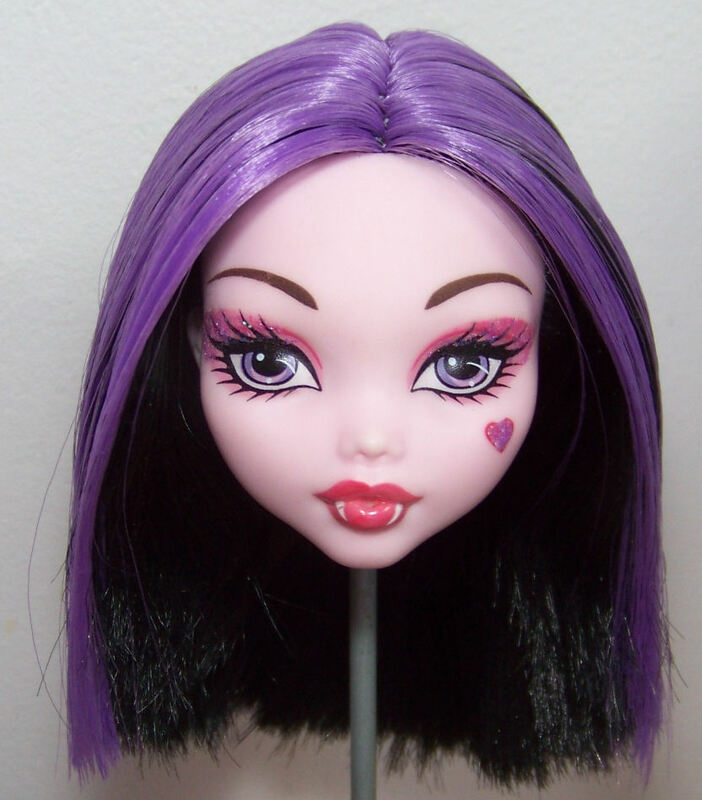 This entry was posted in Tutorials and tagged bratz, hair, monster high, reroot, rerooting, saran on February 23, 2015 by saffy.